With a solid six months of strong sales, especially in Japan, we may see a gradual increase in 3DS titles in development. The latest to be revealed by Famitsu, as translated by Andriasang, is Ex Troopers from Capcom, an action shooting title. The title shares some elements with the Lost Planet series from the HD consoles — except with anime-style visuals — which gives hope that a Western release will eventually arrive. Details are scarce, but you apparently play as an academy member on a snow planet, EDN-3rd, and get caught up in a war with Akrid Aliens. By choosing one of three bases of operations, you ultimately have a say in how the game and its story develop. With Monster Hunter man Shintaro Kojima producing, this may be one to watch. The only other platform announced is PS3, so it'll be interesting to see what direction the title takes on 3DS, though we know from releases such as Resident Evil Revelations that shooters can work and look fantastic on the system. We'll keep you up to date with information as we get it. It's a shame we aren't going to experiance this in E3. Capcom says they don't have any playable games at E3. I hope they will release Lost Planet 3 for Wii u.
Ah, unexpected but quite welcome. I believe I am missing out on something special by not having any of the "Lost Planet" series. I do hope to see it go to Wii U eventually. Hope this turns out good. Nice surprise. Can't wait to see more of it. I'm quite surprised to see this. It's not my kind of game by any means, but the anime style may make a costumer. Anyway, It's great to see more support. An anime style Lost Planet? Can't wait to buy this! a 3rd per3osn shooter on 3DS ? oh yeaaahh !! or maybe im wrong and its a first person shooter ? then even more yeeaahhh !! If I remember right I enjoyed the Lost Planet games, so I'll have to keep my eye on this. It'd be better if it wasn't anime. I hate anime with a passion. You know, now that I think about it, the gameplay of Lost Planet would be suited for handheld devices extremely well. I'm eager to see how this game turns out. Indeed. I would have loved to have played the two Lost Planet games. It would be awesome if they released Lost Planet 3 on Wii U in a special box-set with 1 and 2 as well for the Wii owners who missed out. yes, when are we going to get something besides sport games, shooters, mario's & friends? I know they have more than that. Does N think this is all the West wants? Getting antsie considering selling it...the eshop needs to get real too. I thought Capcom was done with the Lost Planet games after the disappointing 2nd game. I was kinda surprised when they announced Lost Planet 3 and now a 3DS game. Looking forward to both games. One of my friends had the first Lost Planet, and it looked fun, so I might keep my eye on this. The game looked cool here's hopin for western release. Lost Planet for 3DS?? Sign me up! The 3DS needs more "serious" titles. So, just PS3 and 3DS... Interesting..
Kinda would expect PS3 and Vita..
Help yeah just what I need another shooter from a great series. I need help of a mod or someone who know that this game is. http://youtu.be/c2NPbszVZ_U --> Is this a gameplay video of the game announced on the topic?? Let me guess, you'll play a generic looking anime hero, and his school chums will be a beautiful girl who is unsure of herself and always clutches her textbooks close to herself, and a senior who wears glasses, and he's always pushing them back up on his nose? The hero will learn to believe in himself and his wacky group of friends while they continually give eachother single-solemn-head-nods? 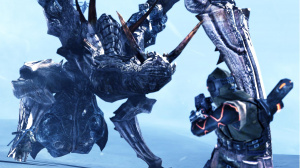 I like Lost Planet, especially when it's in the snow, and fighting akrid, I don't care much for fighting snow pirates. The premise of this new game sounds a bit silly, but we'll see. That's a video of the PC version of the first Lost Planet game (PC/Xbox360/PS3). @ThreadShadow Now that I saw the new scans...you are not far off. But you know what, if that mech piloting gameplay is as baddonkey as it looks in the trailer I can power through some ol 'anime tropes. From the trailer it looks like you'll never be piloting a "VS" in ground combat. The trailer focuses on infantry combat and a glimpse of some suspect Voltron-like space fight.